Do I Know My Worth? Motivational talk from Greenville City Council Representative. Lillian Brock Flemming grew up in the ‘Southside’ community of Greenville, South Carolina. She was motivated to succeed by her parents, Lila Mae and James Brock. As a young person, Lillian Brock focused on excellence and achievement. The acquisition of knowledge was paramount. Lillian Brock graduated from Sterling High School with honors in 1967 and that year she became one of the first three African American women to attend Furman University in Greenville, South Carolina. She earned her Baccalaureate degree in 1971 and her Master’s degree in Mathematics education in 1975. 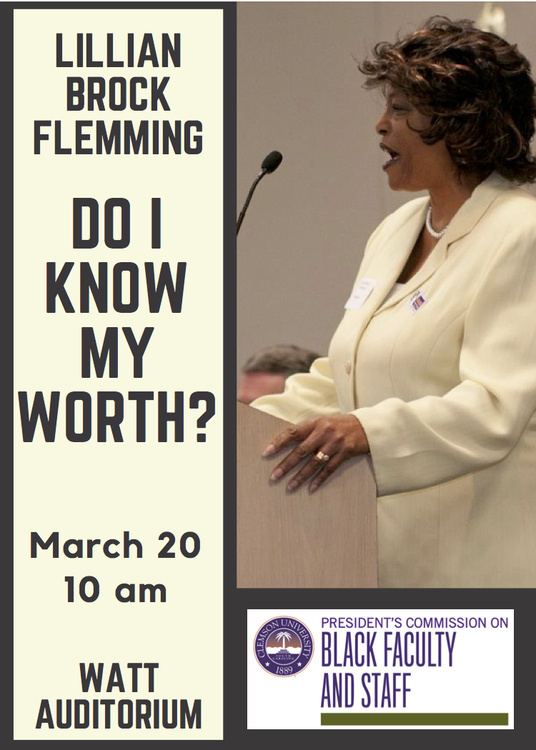 In 1981 Mrs. Flemming became the first African American woman to serve as a Greenville City Council member. She is the first city council member to be elected to five consecutive terms since the 1960’s.